Carlon MRS® industrial electric contacting multi-jet meters are an economical answer for industrial applications needing good tolerance to contaminants, an electrical output signal and total volume registration. With an easy to read register display, the MRS® water meter is designed with reliability and affordability in mind. 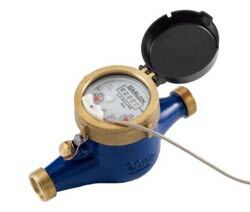 The MRS® series meter is available in sizes from 3⁄4″ to 2”. Carlon’s MRS® Industrial meters meet or exceed AWWA specifications. *Continuous Flow: The size of meter selected should be based upon continuous flow, GPM, as opposed to pipe size. For example, if it is determined that continuous flow is 25 GPM, a 1” meter should be selected rather than a 3⁄4” meter.